Our Kibbutz Katan group directs activities for our younger members and their families, including: monthly Friday Night Young Family Shabbat Services, monthly Saturday Morning Tot Shabbat services, monthly Sunday School Katan classes, Family Havdalah services and Holiday-themed get-togethers for families with young children. Kibbutz Katan programs are open to all young Jewish children and their families in the Western suburbs. While most Kibbutz Katan expenses are underwritten by Congregation Beth Shalom as a service to the local Jewish community, some programs do charge a nominal fee to cover event costs. 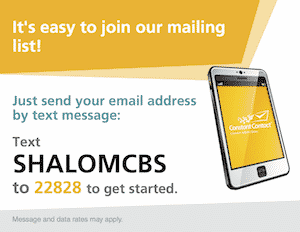 To receive information about upcoming programs, send an email to kibbutzkatan[at]napershalom.org. Young Family Shabbat Services are held on the first Friday night of each month from 6:30 – 7:15pm and include a mix of young child friendly singing and stories interspersed with the traditional Shabbat prayers during a 45 minute service. While the joyous voices of children are always welcome at any Congregation Beth Shalom service – our Young Family Services are especially designed for the interests – and attention-spans – of our very youngest participants. Following the service, there is an oneg (challah, juice, and desserts) where kids and adults can play their way into Shabbat. Tot Shabbat Services are held on the third Saturday morning of each month from 10-11am. Children and their parents and grandparents are invited to hear special stories, sing songs, and celebrate the joyous sounds of Shabbat. We’ll also share challah, juice, and sweet treat. There is no cost for this program, which is mainly geared at kids 6 and under and their parents or grandparents. Families are asked to RSVP to kibbutzkatan[at]napershalom.org to be informed about any changes in format, location, or timing. Sunday Morning Playgroups are held on the 1st and 3rd Sunday morning in the CBS Lobby from 9:30-11am. Family Havdallah services and Holiday-themed programs are offered throughout the year. For more information on any of our programs, please contact kibbutzkatan@napershalom.org.